To Cite: Fahimi S, Abdollahi M, Mortazavi S A, Hajimehdipoor H, Abdolghaffari A H, et al. Wound Healing Activity of a Traditionally Used Poly Herbal Product in a Burn Wound Model in Rats, Iran Red Crescent Med J. 2015 ; 17(9):e19960. doi: 10.5812/ircmj.19960. Background: Burns are known as one of the most common and destructive forms of injury with a vast spectrum of consequences. Despite the discovery of various antibacterial and antiseptic agents, burn wound healing still has remained a challenge to modern medicine. Plants, with a valuable traditional support, have been considered as potential agents for prevention and treatment of disorders in recent years. However, modern scientific methods should be applied to validate the claims about the therapeutic effects of the herbal products. Objectives: This study was conducted to evaluate the wound-healing activity of a poly herbal cream (PHC), retrieved from Iranian Traditional Medicine (ITM), in a rat burn wound model in Iran. Materials and Methods: In this experimental study, PHC containing aqueous extracts of Malva sylvestris and Solanum nigrum leaves and oily extract of Rosa damascena petals was used. Second-degree burn wounds were induced in four groups of five rats each. Group 1 received no treatment while groups 2, 3 and 4 were given cream base, silver sulfadiazine (SS) 1% and PHC, respectively to compare the efficacy of PHC with the negative and positive control groups. The percentage of wound healing on days 2, 6, 10 and 14 and histopathological parameters of healed wounds on the 14th day were assessed. Antioxidant and antimicrobial activities of PHC were evaluated using 2, 2-diphenyl-1-picrylhydrazyl (DPPH) and micro-dilution methods, respectively. Results: There was a significant improvement in healing percentage of PHC-treated rats in comparison to the other groups at the end of the treatment period (87.0% ± 2.1% for PHC in comparison to 32.2% ± 1.6%, 57.0% ± 5.3% and 70.8% ± 3.5% for the control, cream base and SS groups, respectively). Moreover, the healed wounds in PHC-treated animals contained less inflammatory cells and had desirable re-epithelialization with remarkable neovascularization. In addition to the antioxidant activity, PHC exhibited antibacterial effect against Staphylococcus aureus. Conclusions: Poly herbal cream experimentally and histopathologically revealed a burn wound healing activity probably due to the antioxidant, anti-inflammatory and antimicrobial activities of its phytochemical contents. Therefore, this study confirms the use of M. sylvestris, S. nigrum and R. damascena in burn prescriptions in ITM. Burns, with their devastating consequences, are known as one of the most common forms of injury. The destructive outcomes of burns include physical disabilities as well as mental and emotional disorders (1, 2). Despite the discovery of a vast spectrum of antiseptics, burn healing still remains a challenge to modern medicine (3). Allergic reactions and skin irritations are the most important adverse effects of topical antibacterial agents and disinfectants, which reduce the rate of skin repair and increase the rehabilitation period (2). Herbal products could be extensively preferable due to their widespread accessibility and the vast experiential data retrieved from traditional medicine. However, modern scientific methods should be applied to confirm the claims about the therapeutic effects of herbal compounds (4). In Iranian Traditional Medicine (ITM), plants have been used to combat various diseases and pathological conditions. Several ITM prescriptions have been recommended for burn healing; in one of them, combination of aqueous extracts of Malva sylvestris L. and Solanum nigrum L. leaves and oily extract of Rosa damascena Mill. petals has been used (5-7). Malva sylvestris L. (Malvaceae), has been traditionally used to treat skin disorders and injuries (8). It has been claimed that the leaves of the plant have powerful anti-inflammatory, antioxidant and skin tissue integrator properties (9). According to ITM manuscripts, M. sylvestris leaves, with astringent, desiccant and swelling reliever activities, are useful for burn healing (10, 11). Solanum nigrum (Solanaceae) has been used for treatment of inflammation and edema in oriental medicine (12). In Egypt, the healing effect of the plant in burns and infections has been traditionally mentioned (13). Iranian Traditional Medicine scholars believed that aqueous extract of S. nigrum leaves, is astringent and restraint; so, it has been used as a swelling reliever in ITM burn prescriptions with M. sylvestris or other ingredients (5, 6, 10, 14). Rosa damascena (Rosaceae) is one of the most important Rosa species in Iran (15). In addition to perfumery applications of the essential oil of R. damascena, the plant has medicinal properties such as analgesic and anti-inflammatory effects (15, 16) as well as antibacterial, antioxidant and skin wound healing activities (15). It has been claimed that the oily extract of R. damascena Mill. has a cooling effect, and desiccant, flesh-growing, antiseptic and analgesic properties (6, 14, 17). Regarding to the importance of burns and lack of efficient drugs for burn healing in modern medicine, research for finding new drugs especially with natural origin is necessary. In the present study, the healing effect of a poly herbal cream (PHC), retrieved from ITM, consisting of M. sylvestris, S. nigrum and R. damascena extracts has been evaluated in second-degree burn wound in rats. Moreover, antioxidant and antibacterial assessments were performed to declare the probable wound healing mechanism of PHC. The flowers of Rosa damascena Mill. were collected from Kashan, Isfahan Province, Iran, in April 2011 and the leaves of Malva sylvestris L. and Solanum nigrum L. were collected from Shahriyar, Tehran Province, Iran, in October 2011. The plants were authenticated in herbarium of Traditional Medicine and Materia Medica Research Center (TMRC), Shahid Beheshti University of Medical Sciences, Tehran, Iran. Voucher specimens of Rosa damascena Mill. (No. 3378), Malva sylvestris L. (No. 3377) and Solanum nigrum L. (No. 3375) have been deposited in the herbarium of TMRC. Hide powder and 2, 2-diphenyl-1-picrylhydrazyl (DPPH) were prepared from Sigma-Aldrich, UK and Germany, respectively. Sesame oil was obtained from Henry Lamotte, Germany and silver sulfadiazine cream was prepared from Sinadaru, Iran. Other materials, reagents and solvents were purchased from Merck, Germany. The leaves powder of M. sylvestris and S. nigrum were extracted by using the decoction method for 30 minutes (1:20). The extracts were filtered and concentrated under reduced pressure (concentration ratio 100:5). The petal powder of R. damascena was extracted using sesame oil as solvent (1:5). The extraction procedure was done in an incubator at 40 ± 1°C for five weeks. Every week, the old herbal powder was replaced with the new one. Based on ITM manuscripts, poly herbal cream was prepared by using 5% of each aqueous extracts of M. sylvestris and S. nigrum and 33% of R. damascena oily extract in a cream base including eucerin (25%), white petrolatum (28%) and white bees wax (4%). Quantification was done on the basis of the standard curve of pyrogallol. Results were presented as mg of pyrogallol equivalent per 1 g of PHC. All measurements were made at room temperature in triplicate. Where, AS, AB and AC were the absorbance of the sample, blank and the negative control, respectively. The concentration of PHC methanol fraction providing 50% inhibition (IC50) was calculated from the plot of inhibition percentage against the PHC methanol fraction concentration. The tests were performed in triplicate. A Gram-positive bacterium (Staphylococcus aureus ATCC 6538) and a Gram-negative bacterium (Pseudomonas aeruginosa ATCC 9027) were used in the experiment. Antimicrobial activity of aqueous extracts of Malva sylvestris and Solanum nigrum, oily extract of Rosa damascena, PHC and silver sulfadiazine cream were determined using micro-dilution method. The assay was performed according to Soberón et al. (22) with modifications. The bacteria inocula were prepared by suspending cultures in the triptic soy broth (TSB) overnight and adjusted photometrically at 600 nm to a cell density equivalent to 0.5 McFarland standard (1.5 × 108 CFU/mL). Serial two-fold dilutions (7.81 - 1000 μg/mL) of the extracts and creams were prepared in 96-well microplates. Stock solutions of test substances were prepared by dissolving material in Dimethylsulfoxide (DMSO) 10% v/v at concentration of 4 mg/mL. Similar two-fold serial dilutions of cephalexin (0.75- 125 μg/mL) and imipenem (0.09 - 12.5 μg/mL) were used as positive controls against S. aureus and P. aeruginosa, respectively. Wells consisted of DMSO 10% were considered as negative controls. Fifty microliters of adjusted culture inoculums were added to the wells before incubating at 37°C for 24 hours. Sterility of the medium and samples were checked. After incubation, bacterial growth was indicated by the turbidity. The lack of turbidity, indicating the absence of bacterial growth, was interpreted as antibacterial activity. The MIC value was considered as the lowest concentration of the sample that caused complete inhibition (100%) of bacterial growth in experimental conditions (22). The present investigation was an experimental study. Male Wistar rats (250 - 300 g) were used in the experiment. The rats were caged under controlled conditions of light (12 hours light/dark cycles), room temperature (23 ± 1°C) and relative humidity (50% ± 10%) with free access to food and water ad libitum. This study was undertaken according to the suggested international ethical guidelines for the care of laboratory animals under the audit of the commission of animal ethics, Shahid Beheshti University of Medical Sciences (ethical approval No.106, Oct 10, 2011). The back of the twenty rats were shaved under anesthesia (100/10 mg/kg ketamin/xaylazin, intra peritoneal (ip)). Then a deep circular 15 mm diameter burn wound (177 mm2) was created on their dorsal parts, using an electrical heater (110°C for 10 seconds). The underlying skin was cleaned with normal saline (23). In this experiment, the rats bearing second-degree burn wound were divided into 4 groups (n = 5): group 1 was the control group which received no medication, group 2 was treated with cream base, group 3 received silver sulfadiazine (SS) cream 1% as positive control and group 4 was treated with PHC. Silver sulfadiazine, cream base and PHC were used topically every day and the wounds were dressed up. Treatment procedure was started immediately after burn induction for 14 days. Granulated tissues were collected from dorsal parts of the animals on the last day of the experiment and preserved in 10% buffered formalin. Series of 3 - 4 μm thickness sections were prepared and stained with hematoxylin-eosin and photographed under 100 or 400 × magnification. The rate of re-epithelialization, collagenation, neovascularization (angiogenesis) and inflammatory cells were evaluated by a blind histopathologist. All values were expressed as mean ± SD. Data were analyzed using one-way ANOVA, followed by Tukey's post hoc test. The results were considered significantly different at P < 0.05. A quantitative colorimetric assay using Folin-Ciocalteu reagent and hide powder revealed the presence of phenolic compounds and tannins in PHC with the values of 0.73 ± 0.025 and 0.16 ± 0.009 mg per 1 g of the cream for total polyphenols and tannins, respectively. Methanol fraction of PHC exhibited dose-dependent inhibition of the DPPH activity. The IC50 value for PHC methanol fraction was 6.54 ± 0.51 mg/mL. Minimal inhibitory concentration (MIC) values of the plant extracts, PHC, SS cream and positive controls against S. aureus and P. aeruginosa have been shown in Table 1. All samples exhibited antibacterial activity against S. aureus with R. damascena oily extract, the most susceptible one. a Abbreviations: NIE, noninhibitory effect; MIC, minimal inhibitory concentration; PHC, poly herbal cream. The rate of wound healing in PHC and other groups has been shown in Table 2. The percentage of wound healing has been increased in all groups of rats during 14 days. The wound area was found to decrease significantly in all treated groups compared to control on the day 10 and 14 (P < 0.05). On the 2nd day, the wound healing effect of SS was significantly greater than other groups (P < 0.05) while on day 6 there was no significant difference between SS and PHC. On day 10, cream base and SS showed no significant difference in the wound healing property. On the 14th day, a significant difference was observed between the wound healing activity of PHC with other groups (P < 0.05). a Abbreviations: SS, silver sulfadiazine; PHC, poly herbal cream. b Values are presented as Mean ± S.D. c significantly different from SS, P < 0.05.
d significantly different from cream base, P < 0.05.
e significantly different from PHC, P < 0.05.
f significantly different from control, P < 0.05. Comparison of granulation tissue section from PHC-treated rats with the control group showed significant improvement in the wound healing in the PHC-treated group. The microscopic views have been shown in Figure 1. A) Healthy skin: normal layers of epidermis and dermis (× 400). B) Control: Invasive inflammatory cells with no epithelial layer (× 100). C) Control: invasive inflammatory cells with no epithelial layer (× 400). D) Cream base: lack of epithelialization and massive inflammatory cell infiltration (× 100). E) PHC: complete re-epithelialization and well-formed granulation tissue of epidermis with remarkable neovascularization and mild inflammatory cell infiltration (× 100). F) SS: limited inflammatory cell infiltrations along with more collagenation and neovascularization (× 100). SS, silver sulfadiazine; and PHC, poly herbal cream. In the healthy skin, layers of skin were clearly identified; epidermis and dermis were normal. Significant numbers of fibrils, hair follicles, sebaceous or sweat glands were also observed (Figure 1 A). In the control group, invasive inflammatory cell infiltration without an epithelial layer was present and vacuolization of the dermal cells as well as adipose tissue substitution as indexes of immaturity were seen. Edema, hemorrhage and congested capillaries along with no appearance of hair follicles, sebaceous or sweat glands in dermis were clear (Figure 1 B and C). Microscopic views of the cream base group revealed that although active fibroblasts and increased number of new capillaries were seen at dermis, there was no clear wound healing indicated by lack of epithelialization and massive inflammatory cells infiltration (Figure 1 D). In the PHC group, significant wound healing with complete re-epithelialization and well-formed granulation tissue of epidermis and mild inflammatory cell infiltration mainly in perivascular site were seen. Increased number of new capillaries (neovascularization) and irregular myofibroblast distributions, collagen fibers and many fibroblasts were observed (Figure 1 E). In the SS group, limited inflammatory cell infiltrations, complete epithelialization along with more collagenation and neovascularization were present (Figure 1 F). Wound healing is a complicated process occurring in injured tissue to restore its construction and return the damaged tissue to its normal situation as soon as possible (24). There are three stages for wound healing: inflammation, proliferation and remodeling of the extra cellular matrix. The proliferative phase is defined by angiogenesis, collagen deposition, epithelialization and wound contraction (25). The aim of the healing process is to prevent pathogens invasion, confirm the integrity of damaged tissue, and reconstruct the skin physiological function (26). Oxidants are inhibitory factors to wound healing due to their cell damage ability. Studies of the topical application of compounds with free radical scavenging properties on patients or animals have been shown significant improvement in wound healing and protection tissues from oxidative damage. Antioxidants could also have an important role in survival of ischemic skin flaps or promotion of wound healing (27). Inflammation is a protective process conducted by the organism with the purpose of removing the harmful stimuli and initiating the operation of healing. However, the excessive and unbalanced inflammation could delay the healing period and enhance scarring which suggests a promising target for future therapeutic interventions or even predisposes tissue to cancer development (28-30). Therefore, anti-inflammatory compounds are considered as effective agents in wound healing (31). Despite the natural progression of the burn healing process, an infection can delay the process by several mechanisms such as decreasing blood supply, promoting disordered leukocyte function, prolonging inflammatory and debridement phases and producing proteolytic enzymes. So, infection is the major complication of burn injuries and antibacterial agents play an important role in the wound healing process (23, 29, 31-33). Plants have an extensive potential for the management and treatment of wounds and burns with their antioxidant, anti-inflammatory and antimicrobial activities (25, 32). In the present study, the results of healing potential of PHC consisted of the leaves aqueous extracts of Malva sylvestris and Solanum nigrum and the oily extract of petals of Rosa damascena showed that despite the better wound healing effect of SS in the early days of the treatment, PHC had a significant potential for burn wound healing as compared to SS at the end of the treatment period. 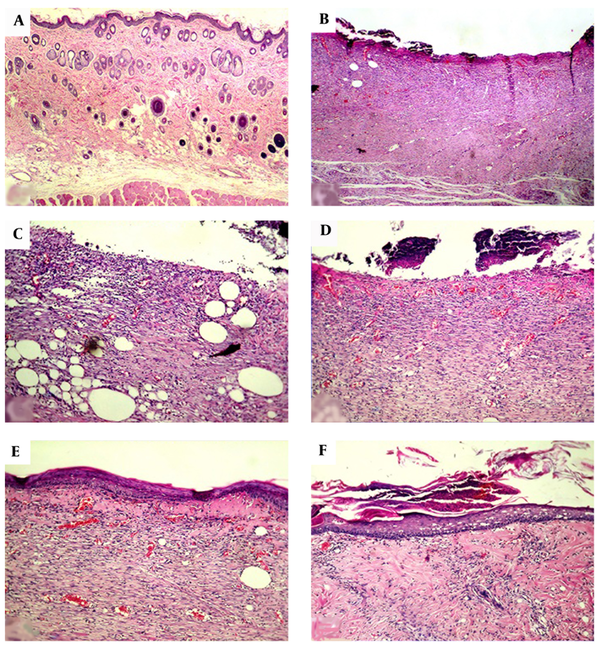 Moreover, histopathological assessment further confirmed the potential of PHC in burn wound healing showing complete re-epithelialization, well-formed granulation tissue, with neovascularization. Antioxidant and anti-bacterial activities of PHC against S. aureus, a common cause of skin and soft tissue infections, have been established in our study as well. Many investigations have been performed on biological activities of the three herbal agents of PHC. The antioxidant and radical scavenging activities of M. sylvestris have been identified by several studies (8, 34, 35). Moreover, the plant has shown topical anti-inflammatory properties (35). Antibacterial activity of M. sylvestris against methicillin-resistant Staphylococcus aureus, Bacillus subtilis, Pseudomonas aeruginosa and Escherichia coli has been established (36, 37). Jimoh et al. (38) have shown that the acetone, methanol and water extracts of the leaves of S. nigrum have proton-donating potency and could be considered as primary antioxidants due to their free radical scavenging activity. The petal extract and essential oil of R. damascena demonstrated antioxidant activity through free radical scavenging and inhibition of the lipid oxidation cycle (39-41). Moreover, the hydroalcoholic extract of R. damascena has shown anti-inflammatory activity in the carrageenan model as well as analgesic effect in acetic acid and formalin tests (42). Quantitative colorimetric assay in our study showed the presence of phenolic compounds and tannins in the PHC. Different aspects of plant polyphenols have been revealed by several studies. Phenolic compounds are natural sources of antioxidants which could act as reducing agents, hydrogen donators, and singlet oxygen quenchers. It has been proved that the antimicrobial efficacy of several plant extracts is associated with their specific phenolic composition (41, 43-47). Herbal products containing condensed tannins are known to have therapeutic uses in wound and burn healing because of their antioxidant, anti-inflammatory and antifungal activities (48). Tannins would promote the process of wound healing and prevent complex consequences of infection due to their antibacterial properties (4). Moreover, tannins can precipitate proteins in damaged tissues, resulting in rapid scab formation. This property enables them to decrease tissue edema and exudation along with reducing the permeability of capillaries in the wound (26, 49). It is believed that tannin extracts enhance the healing process of wounds, perhaps through their potent angiogenic property (26). The healing effect of PHC might be due to several mechanisms such as increasing rate of re-epithelialization and neovascularization, scavenging of destructive free radicals, inflammation reduction and control of infection by the effects of antioxidant, anti-inflammatory and antimicrobial constituents of the plants used in the cream specially polyphenols and tannins as the main components. So, this study confirms the use of Malva sylvestris, Solanum nigrum and Rosa damascena in burn prescriptions in ITM. Silver sulfadiazine cream is the most common topical product used for treatment of burn injuries. The antimicrobial efficacy of this agent is probably the main reason for its widespread use in burn wounds. However, delayed wound healing following treatment is the most important clinical adverse effect of silver topical agents which limits their long-term use, especially on broad wounds (2, 3). According to the current study, in order to achieve the best condition for wound healing in the shortest possible time, the concurrent use of PHC with SS is suggested during the early stages of burn treatment, while using PHC alone would be preferable for later stages of treatment period. Due to the angiogenic effect of the cream, diabetic ulcers and bed sore could be good candidates for future studies. The authors wish to thank Tehran University of Medical Sciences and Traditional Medicine and Materia Medica Research Center, Shahid Beheshti University of Medical Sciences for laboratory support. The article was based on Ph.D. thesis of Traditional Pharmacy (Shirin Fahimi, No. 128), granted by School of Traditional Medicine, Shahid Beheshti University of Medical Sciences (No. 111). Authors’ Contributions: Shirin Fahimi performed the experimental procedures. Mohammad Abdollahi was pharmacology supervisor. Seyed Alireza Mortazavi was pharmaceutical consultant. Homa Hajimehdipoor was traditional medicine and pharmacognosy supervisor. Amir Hossein Abdolghaffari and Mohammad Amin Rezvanfar were pharmacology and histopathology coworkers, respectively.